BioMedServ has investigated a new product for the Europeanwound care market. After (clinical) evaluation we have suggested a strategy for market entry. A major Europeanwound care company is now selling the product . 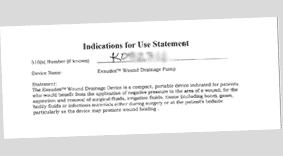 We have participated in the development of a negative pressure wound care device, activities are ranging from starting a company up to 510 K. application for the US market. For several European companies BioMedServ has answered their questions on the field of technology development, production, marketing, sales, regulatory and or legal affairs. During the development of medical devices we have a quiet practical knowledge about meeting the regulatory standards, CE, ISO or FDA related questions. Our in-depth understanding of wound care, not only scientific but also regarding marketing and sales, is well known and we provide a range of trainings for professionals in the field.